If you like big smartphones and think that the stylus is an integral part of the mobile, and at the same time think that Galaxy Note 4 for you is too standard, the company Samsung has something more unique. Presenting your attention the Galaxy Note Edge – smartphone screen which covers not only the front surface but also covers its side. According to its specifications it is not much different from the Samsung Galaxy Note 4, but the screen does its job, attracting a huge number of interested users. This unusual solution has a resolution of 2560 x 1440 + 160. Additional space is used to display different information. This allows you to eliminate the usual multi-tasking, clearing space on the main part of the screen. In addition, innovation is used to run the launcher and control panels of various applications. Looking at the Galaxy Note Edge for the first time, you immediately realize that Phablet design borrowed from the Galaxy Note 4: the location of buttons, metal framing and even the shape of the device show it. In addition, the Galaxy Note Edge also has a stylus S Pen, pulse sensor, cover made ​​of artificial leather and all the other features that are specific to Note 4. But a caveat completely negates the similarities – it curved right-hand side of the screen. Although the Galaxy Note Edge worth $ 120 more expensive than the smooth brother, but the device does not look so impressive. The thing is that the metal frame on the Galaxy Note 4 bit wider. It would seem that such a small thing cannot greatly affect the appearance of the device, but users say the opposite. As for chipset, it is 805 Snapdragon 2.7 GHz, 3 GB RAM, 32 or 64 gigabytes of memory with support for microSD. Note 4 has the same parameters, the only exception is the battery – in the case of Note Edge its capacity is less than 220 mAh and is 3000 mAh. Fortunately, Galaxy Note Edge comes with Adaptive Fast Charging. 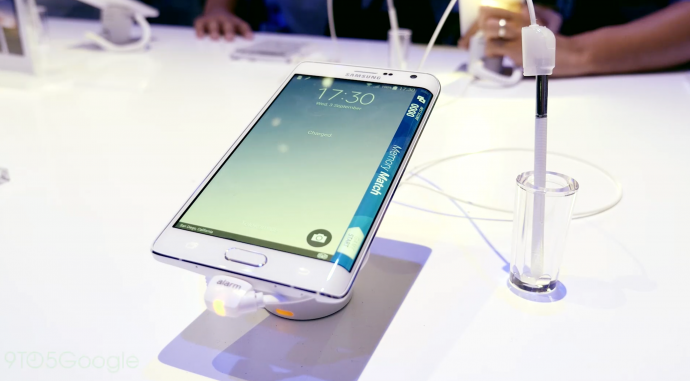 And now next level of fast charging would debut by the Galaxy Note Edge 2 release.